Our first indication of trouble brewing comes around 1 p.m. Wednesday, when our son’s daycare phones to ask us to bring him home four hours early. 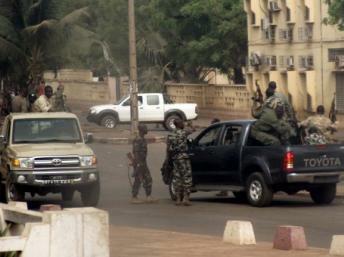 They are closing up, they say, because of possible violence in downtown Bamako. Some of the children at this daycare have parents in high places in the Malian government, and they seem to know which way the wind is blowing. By late afternoon we are hearing reports that the mutineers have taken over the national radio and TV broadcasting center in downtown Bamako, where I just had an appointment on Monday. State TV and radio have been off the air since around 4 p.m. I first hear gunfire coming from downtown, across the Niger River, around 5 p.m. — just sporadic pops and cracks, rifles firing probably into the air. I don’t hear any bursts answering other bursts. It sounds less like shots fired in anger, more like shots fired in frustration. What’s been surprising is how normal our neighborhood here on the south bank of the river has seemed, despite all this. Just like every evening, a small group of young men is clustered by the dry goods shop outside, our compound wall, chatting and watching TV. People come and go. The gunfire doesn’t seem to intimidate here, perhaps because Bamako is normally such a peaceful place and people simply don’t know what to make of it — unlike Brazzaville, scene of repeated civil wars, where the sound of a truck backfiring would send people scurrying for cover. With state TV and radio off the air, we turn to Africable TV for news. 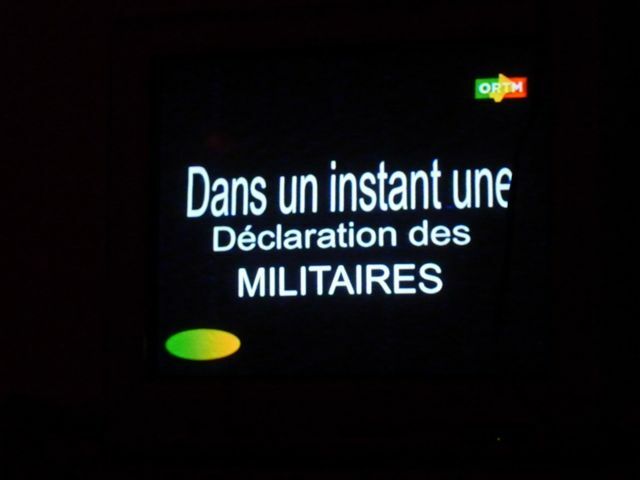 Their anchors describe having met some of the mutineers, who claim to be demanding only greater resources to fight the rebellion in northern Mali, and who say they are not trying to take over the government. Private radio stations are still broadcasting, but none of them seems to be airing any local news — perhaps fearing that troops will shut them down next? By 9 p.m. Africable TV too has gone dark. Now we’re hearing that the action has shifted to Koulouba and the presidential palace, where mutineers may be confronting the presidential guard. Fortunately RFI (French radio) is still in business; around 10 p.m. it reports fighting and possibly flames in the vicinity of the palace. It’s unclear whether this is simply a “misunderstanding among brothers-in-arms,” as some of the mutineers earlier claimed, or an out-and-out coup attempt. Sporadic sounds of shooting persist, still coming from north of the river. Still isolated short bursts of fire, automatic rifles and occasionally heavy machine guns. I did get concerned around 8 p.m. when, instead of the usual “bang bang/pop pop pop” I heard “CRUMP CRUMP CRUMP” — explosions, not shots. Fortunately I haven’t heard that sound since. It’s looking like there will be no school on Thursday…. Anyone got any suggestions for things to do while “sheltering in place” with your kids? Thursday, 12:30 a.m.: Still waiting for that declaration. ORTM has moved on from traditional music to Malian pop (Salif Keita, Mamou Sidibé, Askia Modibo). I’m kind of hoping for something Western-flavored like I used to hear on Radio Folona down in Kadiolo, like Rod Stewart, Phil Collins, the Scorpions or even Chickenshack. Hey, a guy can dream. Speaking of which, it’s way past my bedtime and I hope these soldiers will get moving. 12:35 a.m.: Malijet is reporting that an army officer, a certain Captain Sanogo, has mounted a coup d’etat and that his mutineers have vanquished the presidential guard protecting Koulouba. No word on the whereabouts of President Amadou Toumani Touré. 12:46 a.m.: An online rumor reports that President Touré is holed up in the Djicoroni paratrooper base, where he used to be the commanding officer. But I’m also hearing that he has denied via Twitter that a coup has taken place. 1:35 a.m.: Still no announcement. Going to bed. Oumou thinks they won’t announce anything until they’ve captured the president. This entry was posted in Uncategorized and tagged bamako, gunfire, mutiny. Bookmark the permalink. Thanks for the update. Our daughter Grace just returned from Bamako and is glued to the news. Hope the uprising ends quickly. Do u want to do a pre-recorded interview in ENG with radio France internationale? Thanks for the updates! I hope everyone stays safe…. Thanks for the updates. Funny, that it takes a coup to discover you. Presently, I am outside the country but normally I live in Badala, and work in the area of anthropology.